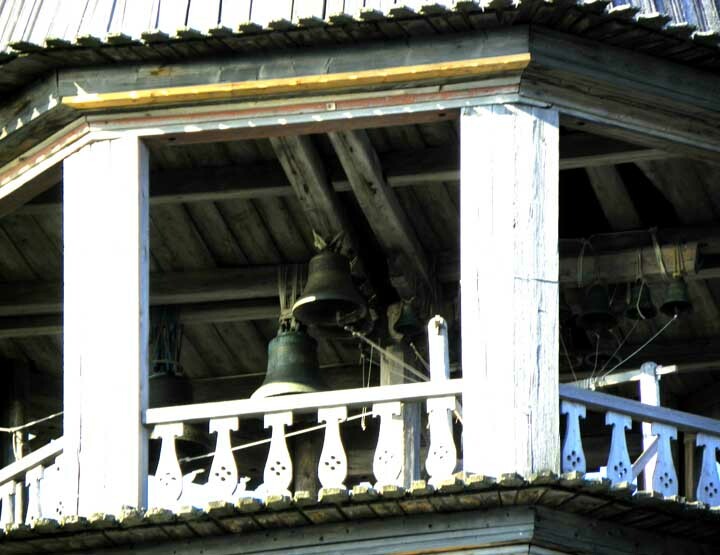 Each village had a wooden bell tower used for communication. Kizhi has full time bell ringers who researched and now perform traditional methods of chiming. 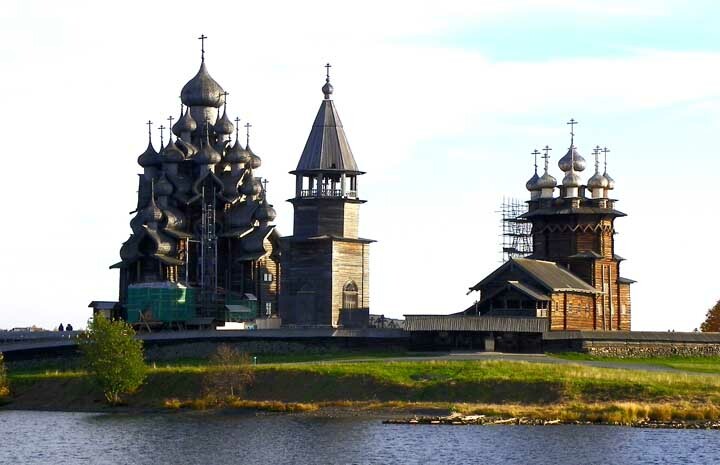 The bell tower of Kizhi Pogost has 14 bells. The chiming is performed every day for guests during the summer months. Built 1862? 1874? ... Octagonal ... 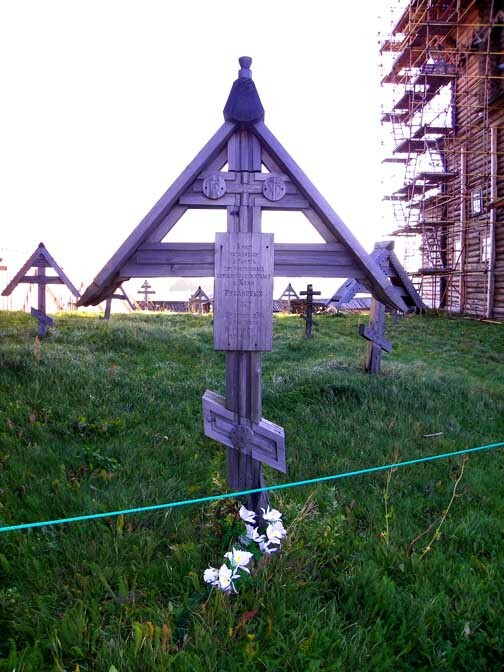 Walls of horizontally-fitted logs, though they are covered by exterior wooden planks and cannot be seen ... Erected without any nails or other metal, and were made of scribe-fitted horizontal logs, with interlocking corner joinery - either round notch or dovetail - cut by axes. 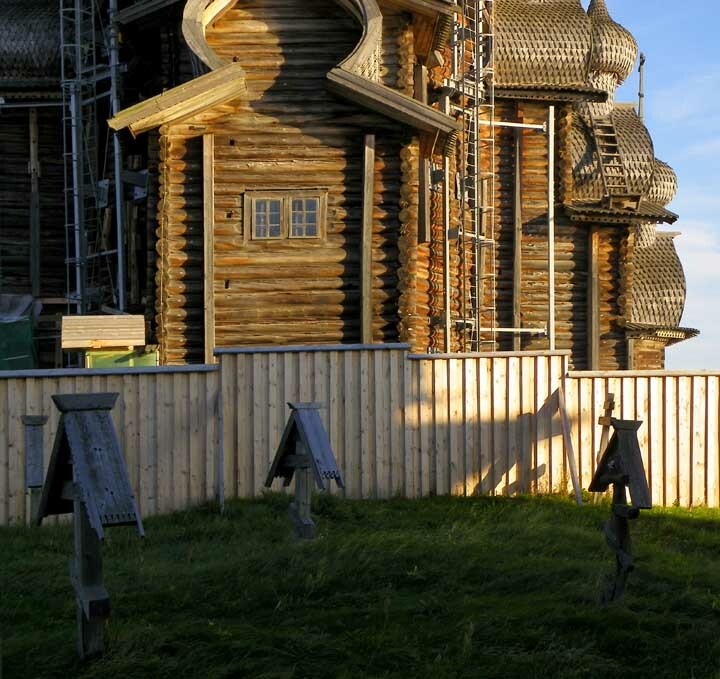 The Kizhi Bel Tower exemplifies a traditional layout for such structures — namely a log-wall base that is square in plan, topped with log walls that are octagonal in plan. The square base comprises two-thirds, and the octagonal top one-third, of the total height of the log walls. Above the octagonal part is a colonnaded belfry with columns supporting the steeple roof. The belfry has railings between its eight perimeter columns. 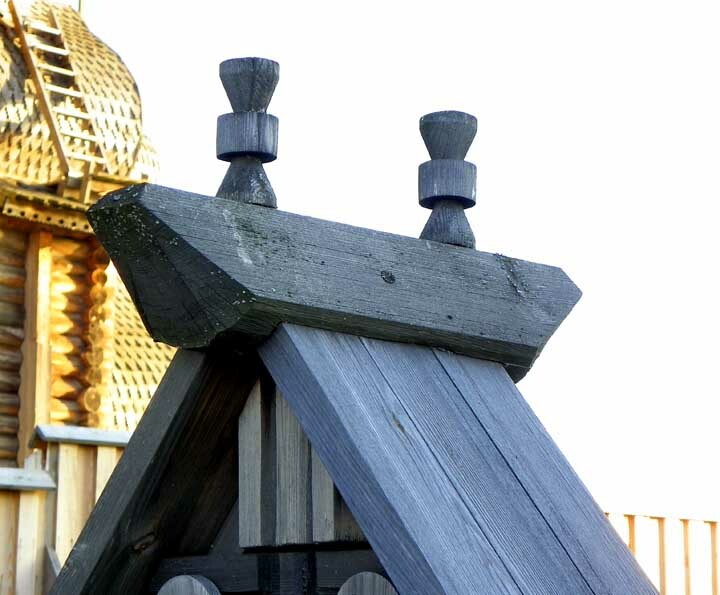 The plank balusters of the railing have a teardrop-shaped central figure with internal fretwork (four intersecting circles inside each teardrop). 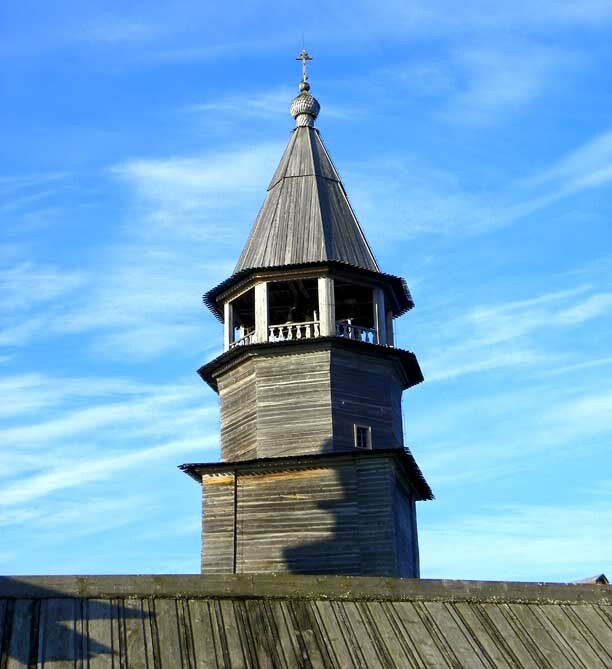 A small, shingled, onion dome topped with a ball and then a cross crowns the Bell Tower. Two cross-walls divide the quadrangle base into three parts: an anteroom, a staircase, and a store-room. Five flights of stairs lead to the belfry. There are three floors: the entry (base); belfry (top); and an intermediate floor at the transition from square to octagon. The logwork of the Bell Tower’s walls uses a construction method in which no log protrudes past the corner intersections, and this made it easier to cover the walls of both the square and the octagonal structures with plank siding. The planking is fastened to vertical sleepers, not to the log walls themselves.